Who doesn’t love a good owl? There are few families of birds where despite a cosmopolitan distribution I’m always so pleased to see any species of the family. 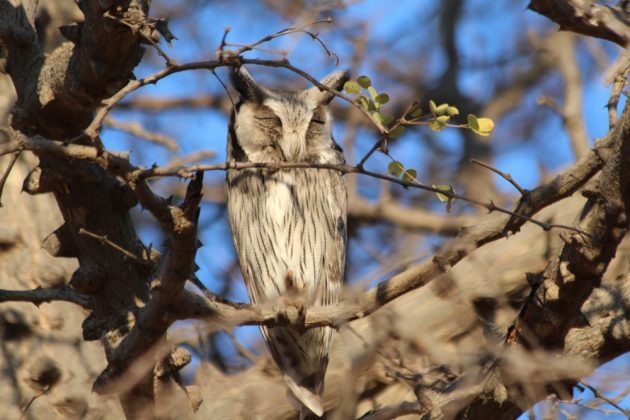 owls aren’t rare, but they are seldom easy. I can spend months in some locations without seeing a single one, in fact in 10 years in New Zealand although I hear them on a monthly basis I have seen them precisely 3, yes three, times. Can you see them? I did! 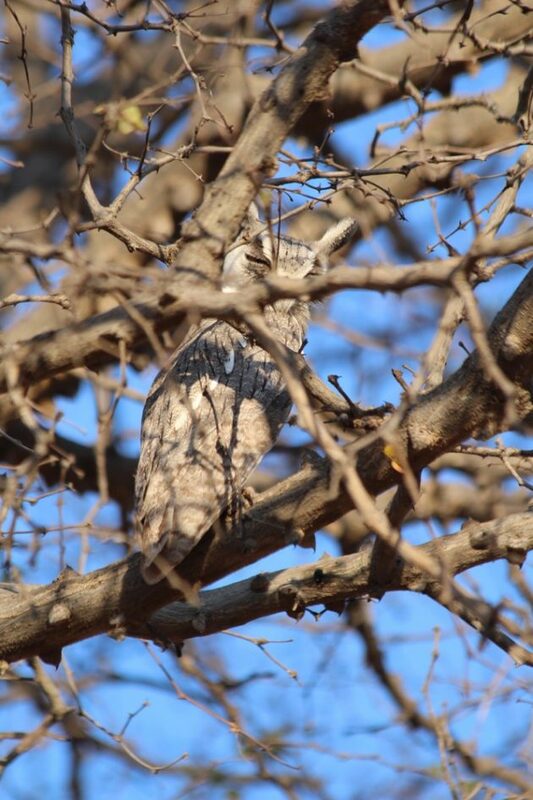 So imagine my delight to seeing a pair of African Scops-owls on the side of the road on a recent trip to Botswana. And I spotted them, not the guide, a near-first. This was only the second time I had ever seen this species in all my time on the continent. The species is a common one, found from the Gambia to Somalia and from the Sudan to South Africa. But they are hard to see, as you can see from my photographs. 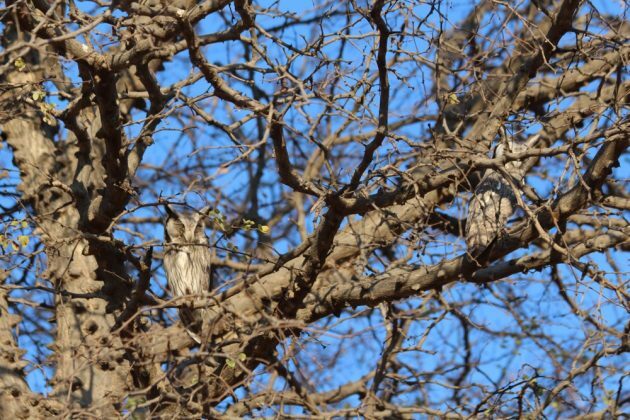 NOTE: I’ve been informed these may be Southern White-faced Owls by someone who knows birds better than I do. So, uh, they’re an owl, and I’d listen to them about their identity. What a cool sighting. Yeah, so hard to find! In Costa Rica, I keep an eye out for roosting owls pretty much every time I go outside whether birding or not- never see one! Lovely! I remember the time in Monteverde Costa Rica when we were walking along a little used trail in the forest and happened to look up to see two Spectacled Owls roosting low over the trail. They just squinted at us and continued resting. Never forget it. 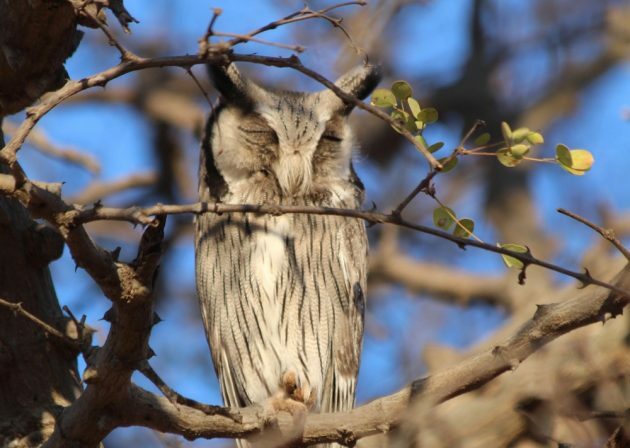 African scops owl. White-faced has a much clearer white facial disk, which is trimmed black. It is also significantly larger, but that’s hard to determine without comparison. The orange eyes would have clinched the ID. 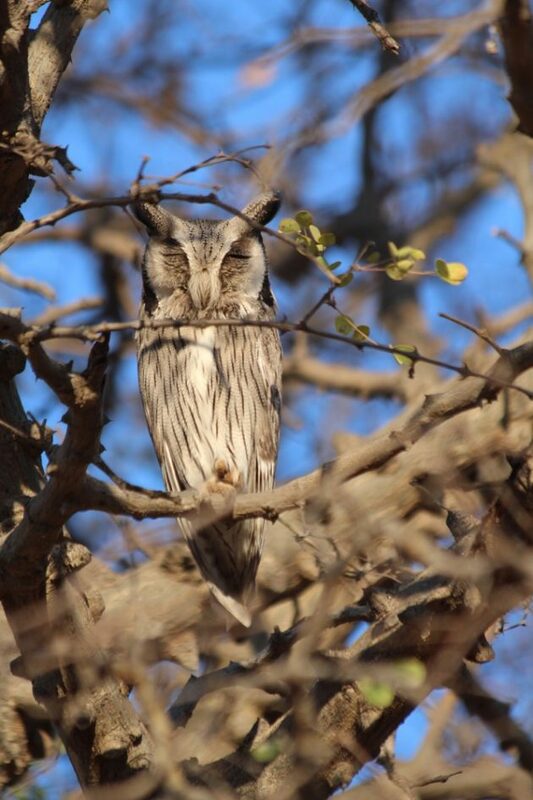 I would go for the White-faced Owl. Black surround to a white face. At least three Tawny Owls and a Little owl can be heard from my house, but I can’t find any of them!